Furnace duct work, whether it is in a basement or elsewhere in a house, can be unsightly. The ducts are made of galvanized steel and have a shiny, silver appearance. Furnace ducts can be painted, but using the correct kind of paint is necessary for the best results. Galvanized duct work, particularly in a basement, needs to be cleaned thoroughly before it is painted. Use a regular household cleaner and a rag to remove all dirt, dust and other debris from the ducts. If the debris is really caked on the ducts, then you may use a more powerful cleaner. Wiping the cleaned ducts with a cloth and letting them dry before you begin the painting process is essential. An oil-based primer rated for use on metal helps paint adhere to galvanized steel. Place drop cloths underneath all of the duct work, and use a paintbrush or paint roller to apply the primer. The underside and back of the duct work can be difficult to reach, and a long-handled paintbrush will help you put primer on those areas. Because duct work is suspended from a ceiling, paint drips may be a problem. Use a light coat of primer, and smooth out drips as they occur on the ducts. The primer requires about four hours to dry. 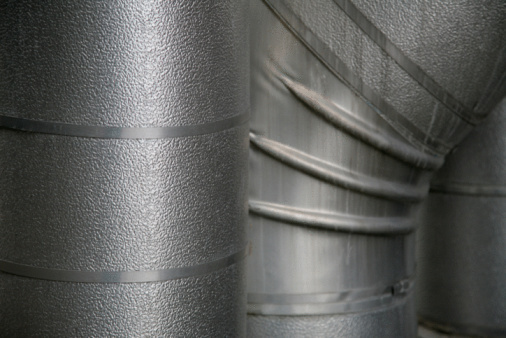 Oil-based paint that is rated for use on metal works best on furnace ducts. Avoid latex or regular paint because it will not adhere properly, even on top of a coat of primer. Use a paint roller in visible spots for a smooth finish and a paintbrush for other areas. A thin coat of paint is best, even if it means putting more than one coat of paint on the ducts. Oil-based paint and oil-based primer can have noxious fumes. In a basement where ventilation could be a problem, a fan can help to circulate the air. Wear a respirator that is intended for use around chemicals. Open the basement's door to encourage better airflow. In a moist environment such as a basement, paint and primer take longer than usual to dry. Checking the paint or primer for dryness before adding another coat is ideal.